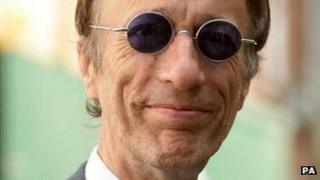 Bee Gees star Robin Gibb was unable to attend the London premiere of his first classical work because he has contracted pneumonia, his son has said. In a message read out to the audience at Westminster Central Hall, Robin-John Gibb said his father was in hospital, but "sends all his love". "We are all praying for him and hoping he has a speedy recovery," he added. The singer had also been due to perform a new song, called Don't Cry Alone, at The Titanic Requiem concert. The requiem, composed by both father and son and performed by the Royal Philharmonic Orchestra, commemorates the 100th anniversary of the sinking of the ocean liner. In February, Gibb said he had been making a "spectacular" recovery from cancer but he was later readmitted to hospital for intestinal surgery. "Of course these are all the periphery problems that occur when you have an illness like that," his son told Reuters. "I don't think there'll ever be a time in the future where he is not in and out of hospital because you have to keep constant scrutiny on these things. "Sadly that's the way it is, and tonight he would love to be here and we're really at a loss because we really wanted him to see this and be able to see our baby come to fruition." Concern for Gibb's health was raised in recent months by his gaunt and frail appearance. But the singer said a growth in his colon had "almost gone" and he was feeling "fantastic."